The Woodlands01263 715779work01603 870304fax Self-cateringThis fabulous cottage is a rural hideaway for 2 where the owners have created a luxe lifestyle to enable you to refresh, relax and unwind and if you have a four-legged friend, they can come too! With 8 acres of woodlands on the doorstep the cottage setting offers a walkers' paradise on the outside and internally has a comfortable sitting/dining room with woodburner, for those colder days, well equipped kitchen, king-size bed and bathroom. Close to The Broads National Park, the coast at Cromer and the delightful market town of Aylsham there is plenty to discover. The National Trust houses of Blickling Hall - the birthplace of Anne Boleyn and the hidden gem of Felbrigg Hall from the Jacobean era are also close by. • Outside: Patio area with garden furniture. 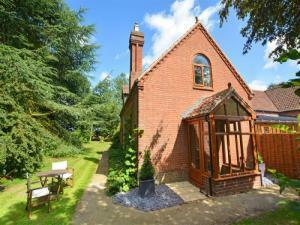 Guests have the use of the owners extensive grounds and woodland walks. Garden not enclosed. This fabulous cottage is a rural hideaway for 2 where the owners have created a luxe lifestyle to enable you to refresh, relax and unwind and if you have a four-legged friend, they can come too! With 8 acres of woodlands on the doorstep the cottage setting offers a walkers' paradise on the outside and internally has a comfortable sitting/dining room with woodburner, for those colder days, well equipped kitchen, king-size bed and bathroom. Close to The Broads National Park, the coast at Cromer and the delightful market town of Aylsham there is plenty to discover. The National Trust houses of Blickling Hall - the birthplace of Anne Boleyn and the hidden gem of Felbrigg Hall from the Jacobean era are also close by.